This is so beautiful and fascinating dear Amalia! your magnificent soul shines through your art and poetry so gloriously! May your dreams come true. Love the dream catcher. The stuff of dreams is a glorious place. A pretty wind catcher, Amalia. What a pretty dream catcher. I wouldn't find finding a warmer clime to winter in. I smiled after I read you title and then saw your ribbon and crochet dream catcher. Amalia, may you always winter in peace, despite the journey's dangers. The other morning I stepped out on the kitchen porch to let my dachshunds out and caught the sight of five geese circling right over my head as they flew down to land on the pond. There was something about the sight of their white underbelly that seemed so vulnerable. It was a nice start to my day. It is so pretty and your creativity never ceases to amaze me. Love your dream catcher! That is so pretty and you did an amazing job! Love and hugs! How pretty!! The ribbons are a lovely touch. And of course your words are magic, as always. Such a cute poem! love it.. Always is lovely have dreams dear Amalia. May yours dream come true!! beautiful! Flying with the geese, now that is indeed a happy dream. Such a beautiful poem shared with a delightful creation... how lovely it would be to fly and touch the sky! Spring is coming here, thankfully! Hoping it delights your world too :) Blessings to you! Your dream catcher looks great, and I enjoyed your poem. What a sweet poem, Amalia! May all your dreams come true! 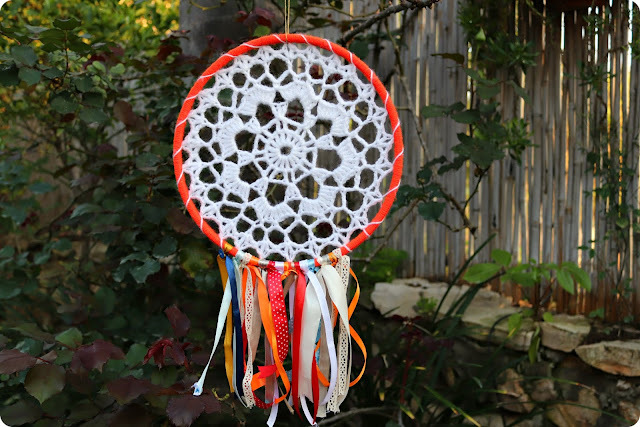 I have always loved dream catchers! So happy they are still around. Yours is beautiful and colorful....may it catch all your best dreams! The whole idea of catching dreams is so delightful isn't it and your dream catcher is lovely! So beautiful! Both the poem and the dream catcher. Have a delightful weekend! Hugs! Wonderful poem and a beautiful dreamcatcher! I love your poem, Amalia, and the dream catcher is wonderful! You had a good flight with them. And such a pretty dreamcatcher too. I now have that song from the musical in my head. Wonderful poem and I love the dream catcher! A wonderful poem and a wonderful dream catcher. Lovely Amalia, thanks for sharing on craft schooling Sunday! Never -never let go of your dreams, Amalia! They are part of your destiny of why you are here on earth! With some it only becomes more visible later in life, when there comes an unexpected opportunity to get there, so if you need a dream catcher to remind that, so be it:) I see dreams as a way the God who made you is telling you what destiny/purpose you have in life (see Jung's writings). Love you shared with All Seasons you your dream catcher looks! Lovely.. hang on to those dreams my friend. Catch those dreams and hold on to them! They will keep you going on bad days and make the good days even better! Your sweet post reminds me of a mug that my favorite cousin recently gave me. It said, 'It all starts with a dream' on the outside. Inside, the mug said, 'Dream it, believe it, achieve it.' Your dream catcher is adorable and I hope that all your dreams come true. Dreaming is a lovely endeavor... And so lovely is your catcher of dreams. So many colorful ribbons and pretty lace too. May all your dreams come true Sweet friend. I like to touch the sky. :-) Your poem has me smiling inside. Who wouldn't want to fly with the geese? Fun post -- thanks. I would never, in a million years, think to crochet the middle of a dream catcher! Wow. Thanks for sharing this lovely piece of handiwork and cute little poem. Bom dia, seu sonho são incríveis, quem sabe se uma dia consegue viajar com os gansos? O apanhador de sonhos está bem trabalhado, é lindo. How very beautiful your dream catcher (and poem) are. I love the bright, colorful ribbons! It all says "Spring is here!" finally!! It reminded me how at the store the other day I stood looking at the clothing section and thought how much prettier the colors are for spring and summer clothes than drab winter wools and such haha! and the beautiful dream catcher will help you! Thank you, Amalia, for your thoughtful words today. My son is healing and doing better. It would be fun to be able to fly with the geese. Sweet dreams and happy new week! Hello, the dream catcher is pretty. I enjoyed your poem, very nice! Happy Monday, enjoy your day! Wishing you a great new week ahead! Very pretty dream catcher and poem Amalia. You are very talented, Amalia !! Your dream catcher is so beautiful !! When I saw your dream cacher on your instagram, I thought it's so great and cute!! I imagine you fly with a geese in the sky! !